A rhythmic relation with the universe, like that expressed by Rilke, finds expression in Paul Klee’s series of garden pictures dating from 1926, which includes A Garden for Orpheus and Classical Garden. 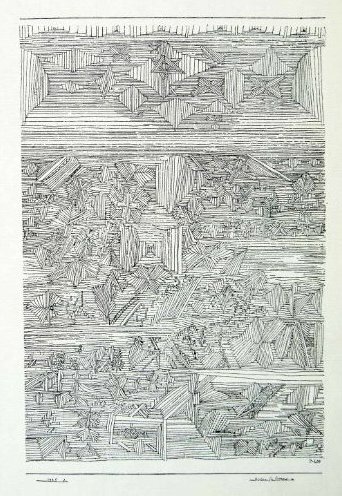 In these works a system of horizontal lines interwoven with ornamental arrangements of interlocking parallell bands is united in space by overlappings and interpenetrations. Like his other garden and park pictures, Klee’s drawing A Garden for Orpheus reflects his search for rythmically coherent formal structure inspired by the orderly divisions inherent in the garden, as well as his attempt to reduce the plant kingdom to archetypal forms and recurring patterns that demonstrate the inner laws of nature, itself a skillful geometrician. Drawings such as A Garden for Orpheus demonstrate Klee’s sense of the interrelationship of nature, music and art. 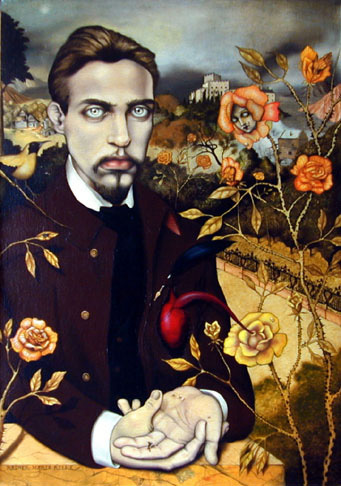 New Poems is a two-part collection of poems written by Rainer Maria Rilke (1875-1926). The first volume, dedicated to Elisabeth and Karl von der Heydt was composed from 1902 to 1907 and was published in the same year by Insel Verlag in Leipzig. 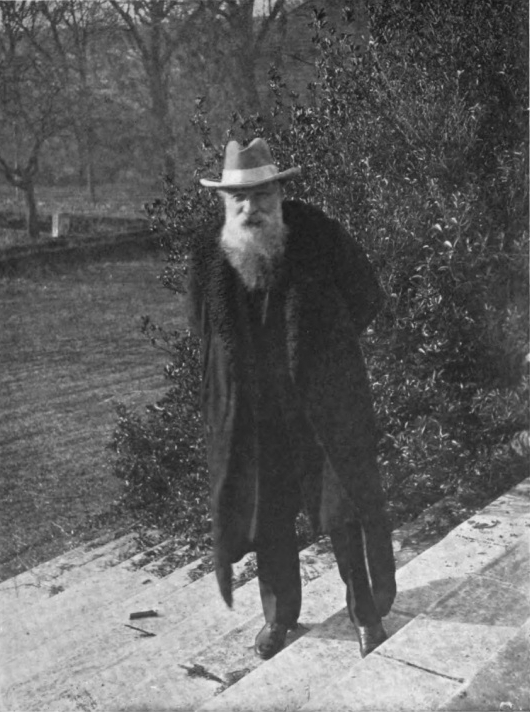 The second volume (New Poems: The Other Part), dedicated to Auguste Rodin, was completed in 1908 and published by the same publisher. 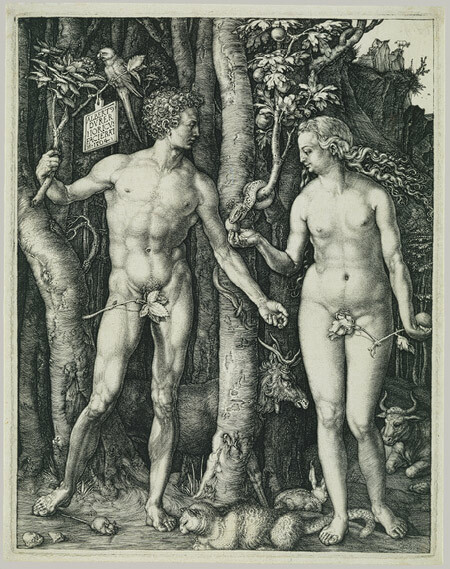 „Da stieg ein Baum. O reine Übersteigung! 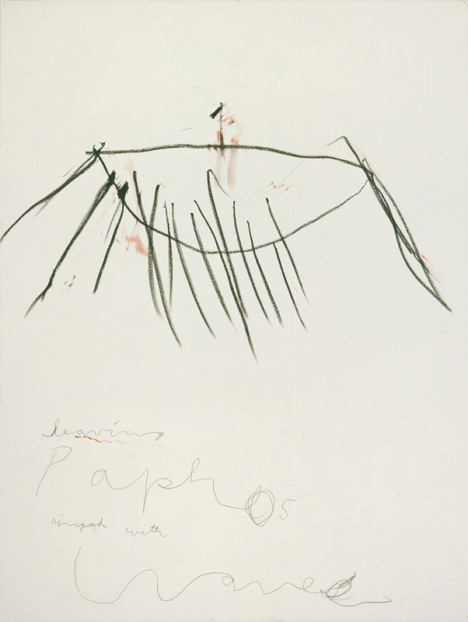 O Orpheus singt! O hoher Baum im Ohr. “There rose a tree. O pure transcendence! 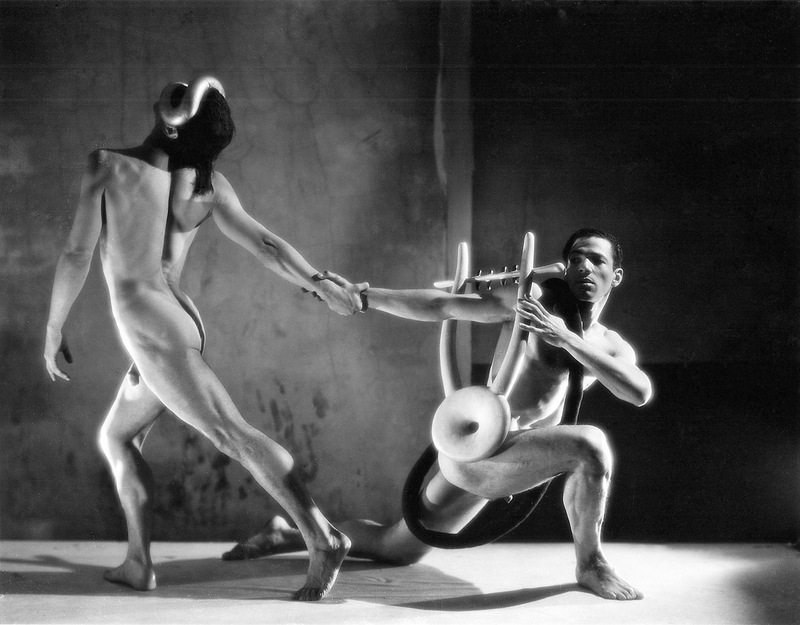 O Orpheus sings! O tall tree in the ear! proceeded new beginning, sign and transformation. 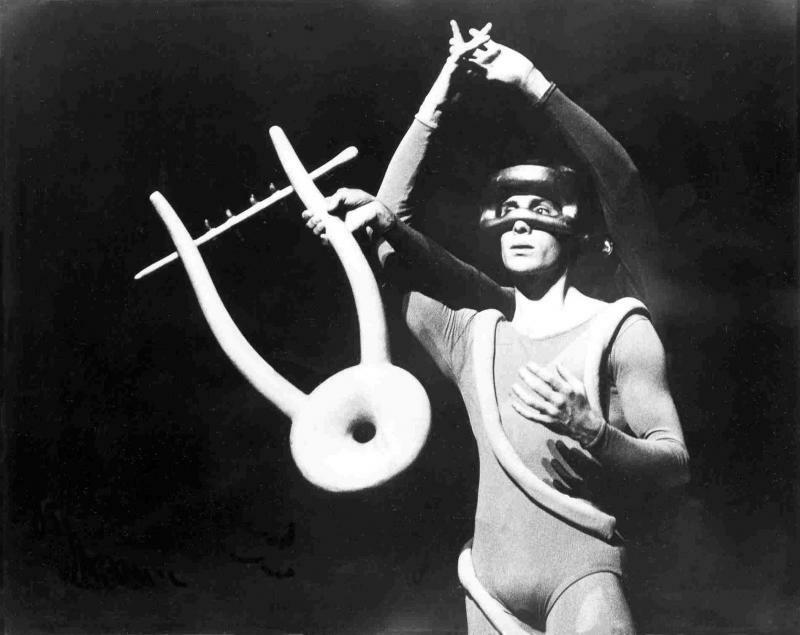 Noguchi’s rendition of Orpheus’ lyre was adopted as and remains City Ballet’s official symbol. 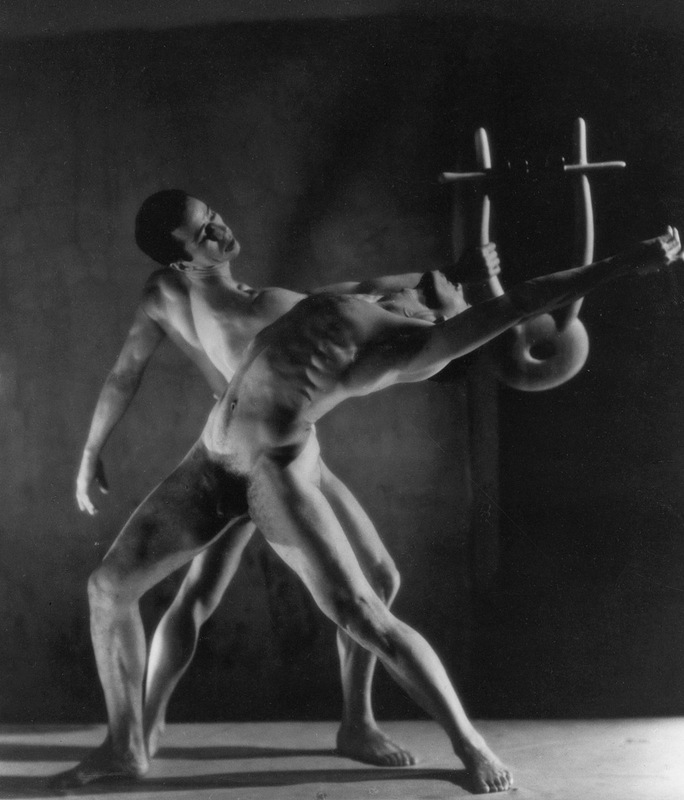 a man follow him through the narrow lyre? 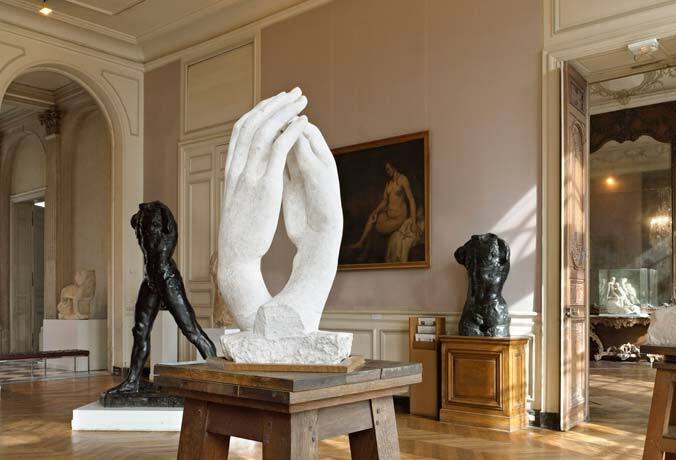 First opened to the public on 4 August 1919, the Musée Rodin was housed in a mansion, formerly called the Hôtel Peyrenc de Moras. 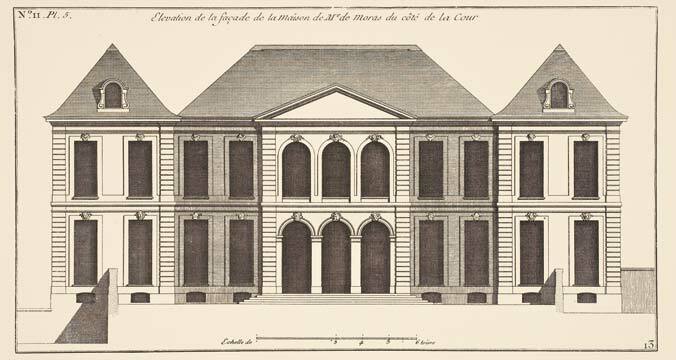 Now known as the Hôtel Biron, it was built in the Rue de Varenne, Paris, between 1727 and 1732. 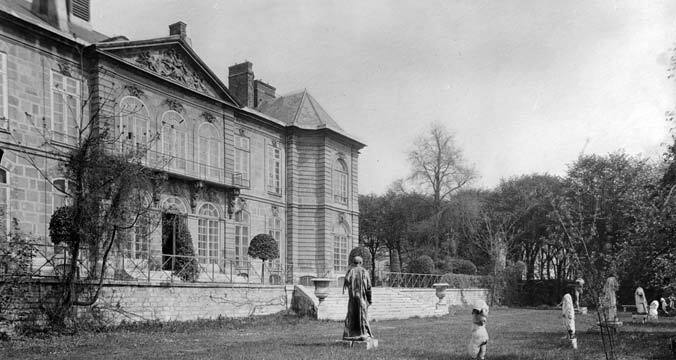 The estate was put up for sale and while awaiting a buyer, tenants were allowed to occupy the Hôtel Biron from 1905. 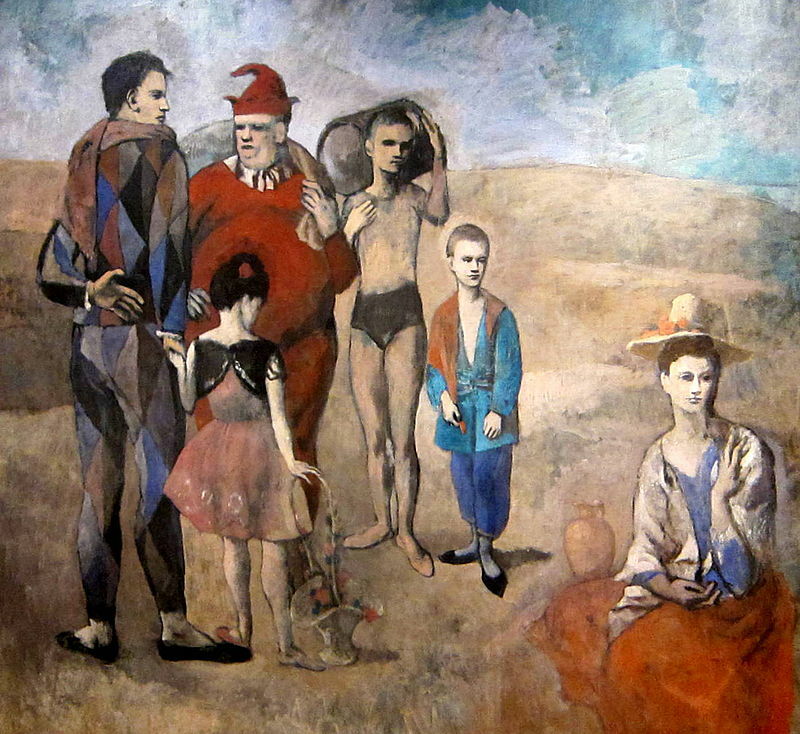 Among them were several artists, Jean Cocteau (1889-1963), Henri Matisse, the dancer Isadora Duncan and the sculptress Clara Westhoff (1878-1954), future wife of the poet Rainer Maria Rilke (1875-1921), who first told Auguste Rodin about the estate. 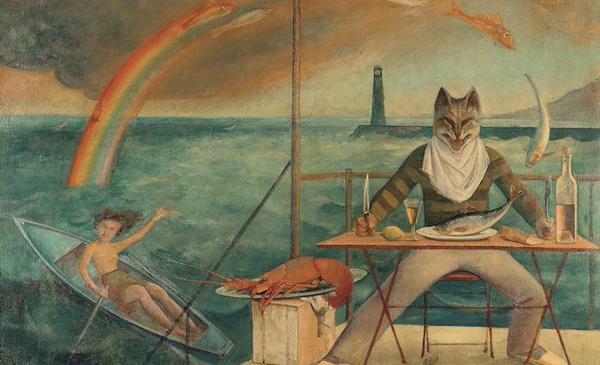 In 1908, the sculptor thus rented four south-facing, ground-floor rooms opening onto the terrace, to use as his studios. The garden that had run wild probably made a strong impression on Rodin, encouraging him to place some of his works and part of his collection of antiques amidst its greenery. From 1911 onwards, he occupied the entire building. 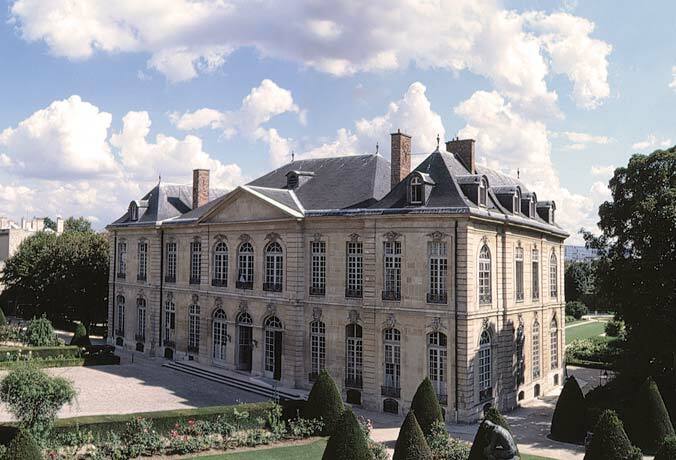 Listed as a historical monument in 1926, the Hôtel Biron and its grounds have since undergone major renovation and restoration schemes, to better assert their role as a museum. 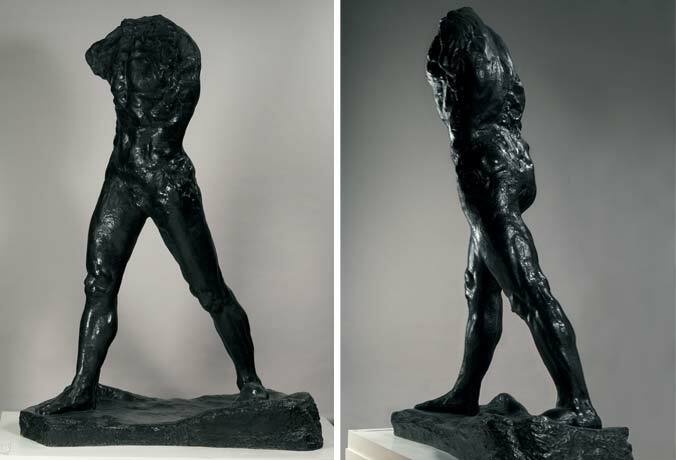 Having eliminated all anecdotal details to focus on the sensation of movement, Rodin produced an unprecedented and powerfully expressive interpretation of it, reiterating the force that had so captivated him when standing before incomplete antique statues and Michelangelo’s unfinished works. at the end of the path which I’ve only just begun. a sign appears, echoing our own sign . . .
folded a pewter plate for laughs. as though it once held two of him. to bounce, thud, upon the grave. Craft a vessel to contain it! from a badly twirled baton? 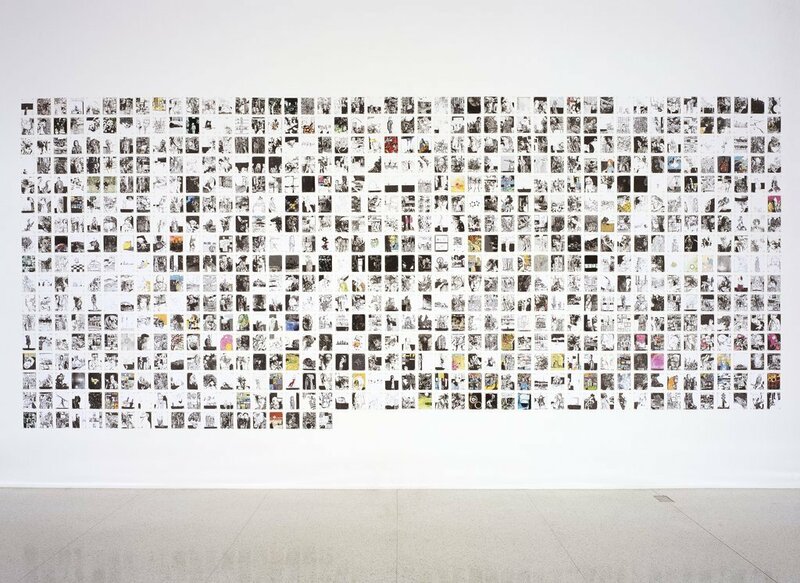 of the innumerable and silent dead? 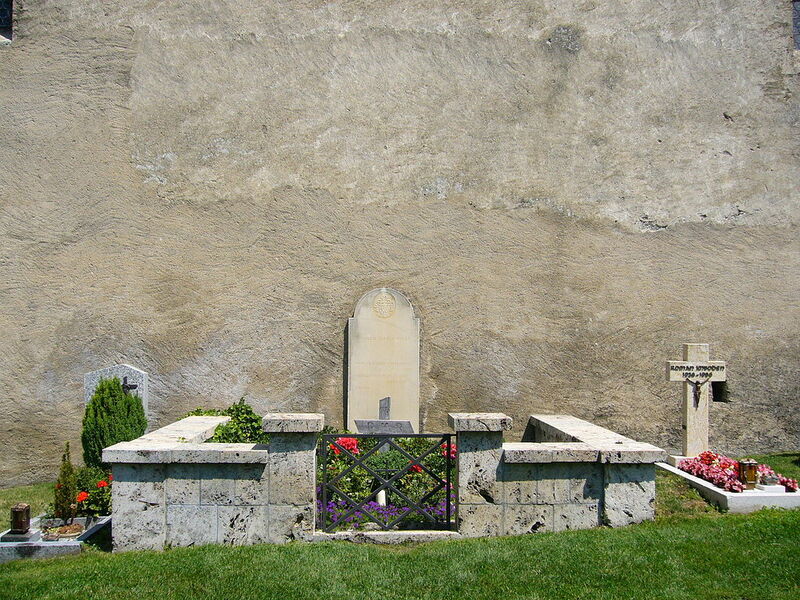 Rilke chose both his own gravesite and epitaph. He is buried where one can see both German-speaking villages and land where the main language is French. Late in his life Rilke began writing in French, so this burial site at the edge of his German-speaking world suits his writing well. So does the blend of vastness and intimacy that so nearly reflects the quality of Rilke’s own poetic voice. Rilke here compares rose petals to eyelids, and remarks that unlike eyelids, the petals conceal no desire for sleep. But the word for eyelids (Lidern) happens to sound exactly like the German word for songs (Liedern), so this pun in sound also lets him say that beneath his many songs there is no desire to be anyone’s sleep. 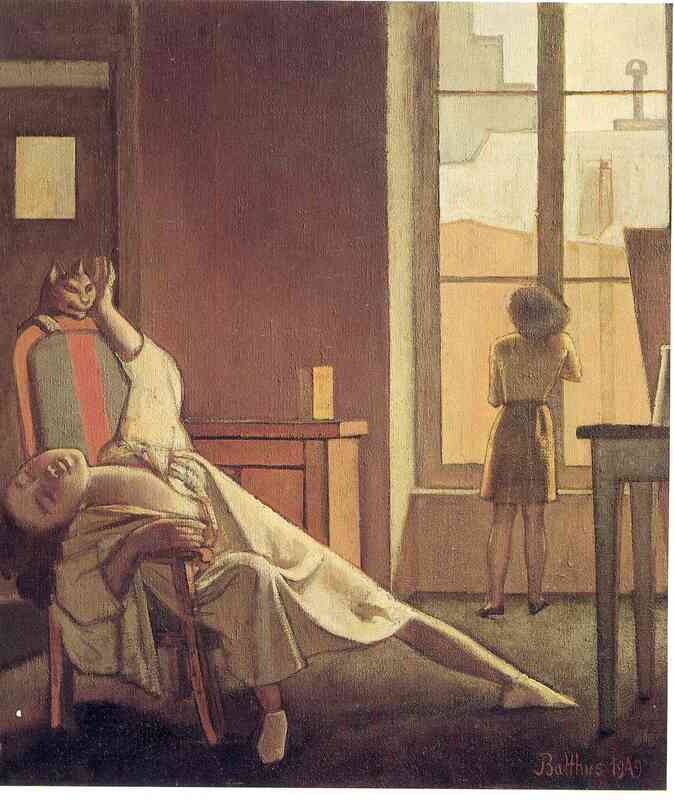 the epitaph refrains from saying that the rose (or the poet) desires no sleep for itself alone. Instead it says it does not want to be anyone’s sleep. So Rilke’s desire may be for a general awakening, not just his own. 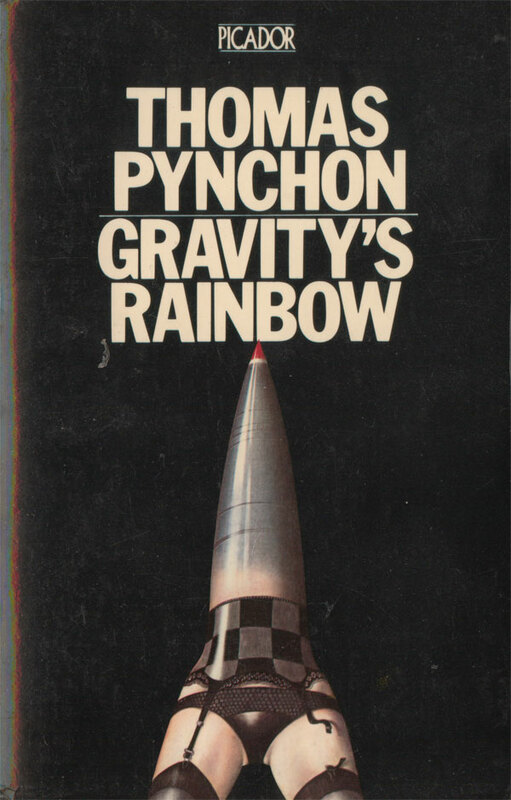 Translated from French by A. Poulin Jr. 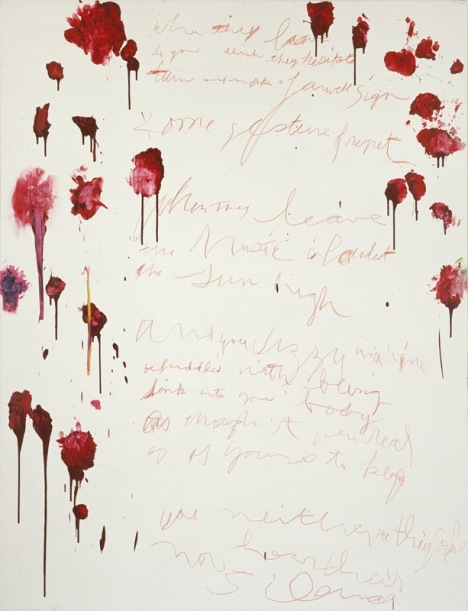 The Rose series recall Cy Twombly‘s earlier cycle of paintings, Analysis of the Rose as Sentimental Despair (1985), which also referred to quotations by Rilke, as well as Rumi and Giacomo Leopardi, embracing conceptions of nature dominated by its inevitable demise. 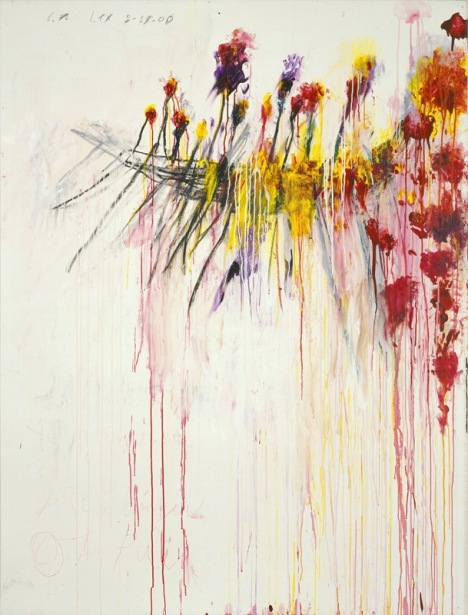 Twombly’s ardent, bold, and often flamboyant use of colour has other affinities — with Andy Warhol‘s Flower series, for example, or Henri Matisse‘s late paper cut-outs. 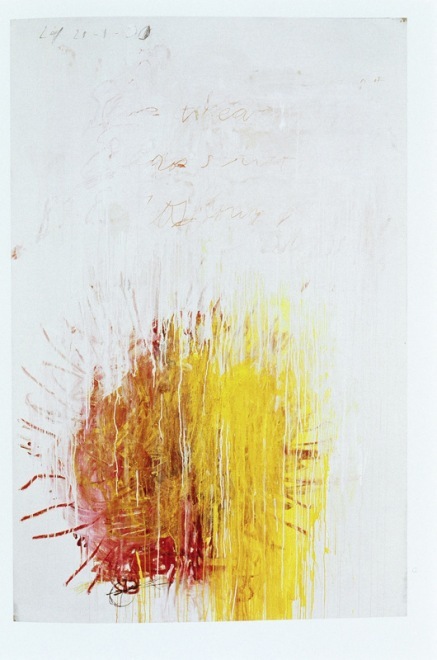 But just as the rose recurs throughout Rilke’s work as a memento mori, so does Twombly employ the motifs and conditions of the natural world to allude to the pleasure and transience of life. 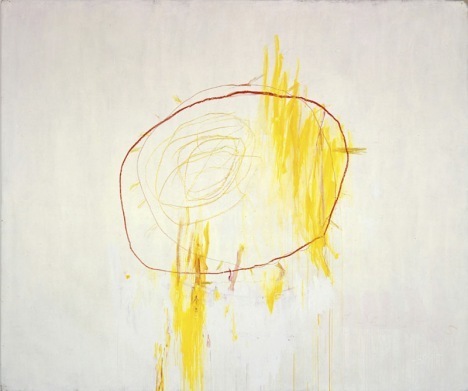 The poetry of Rainer Maria Rilke has inspired a number of Cy Twombly’s sculptures and paintings. 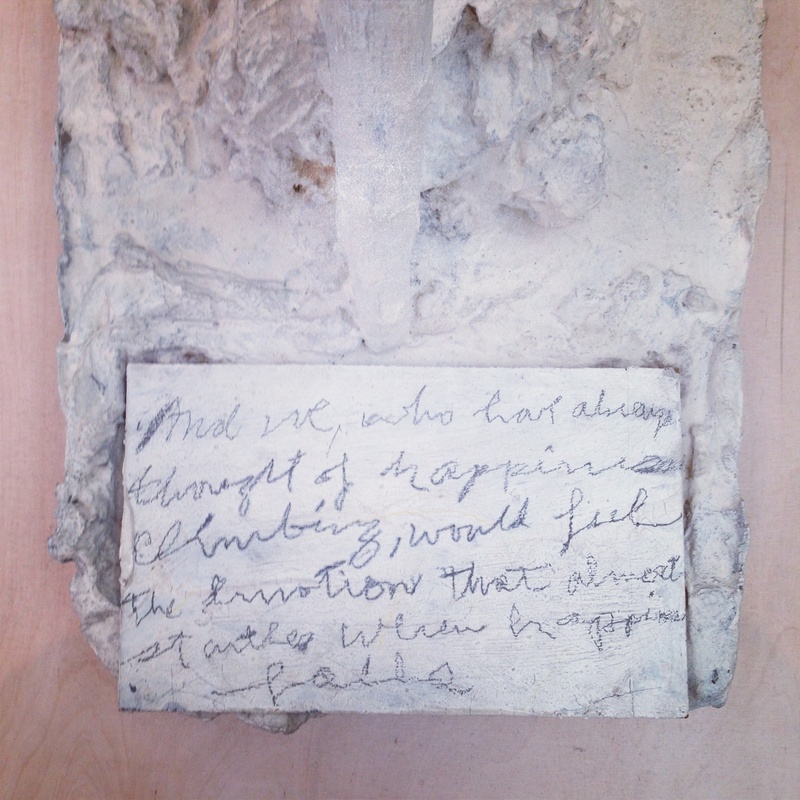 Here the last line from Rilke’s Duino Elegies is scribbled onto a piece of card at the base of the work: ‘And we who have always thought of happiness, climbing, would feel the emotion that almost startles when happiness falls’. 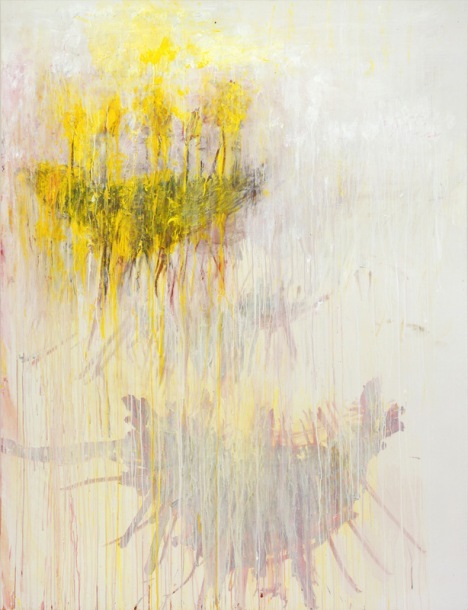 The sculpture itself resembles a slender tree that has broken in two. The broken section leans almost vertically against the still upright other half. 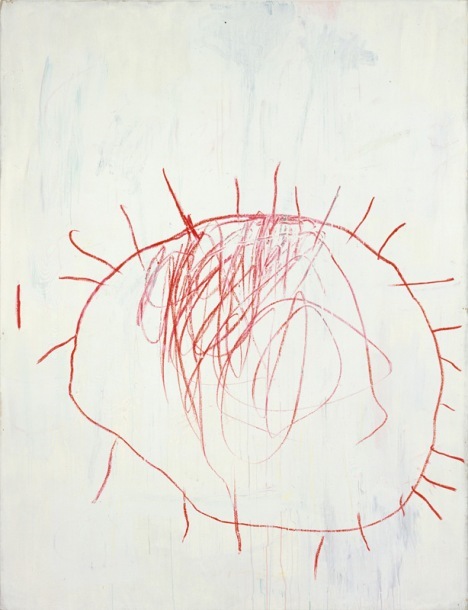 There is a felicitous symmetry in Twombly’s incorporation of Rilke’s elegiac prose, given the role of art in the poet’s work. 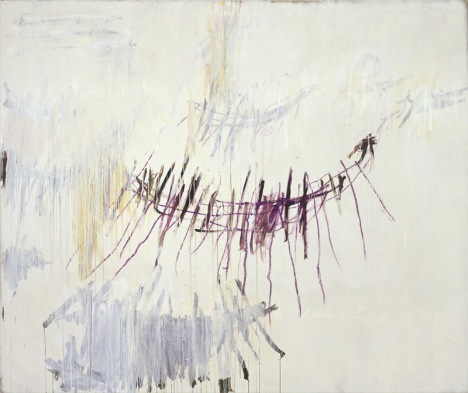 Twombly’s Orpheus (Thou unending trace) draws its title phrase from a verse of Sonnets to Orpheus, Rilke’s 1922 homage to his mythological forebear. 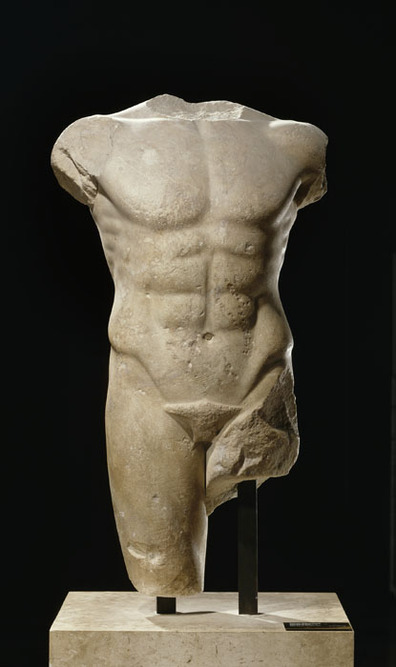 The songs of Orpheus, the progenitor of poetry and music, could impel stones and trees to move, and his “unending trace” is the lyric art that lives on despite his death at the hands of the maenads. 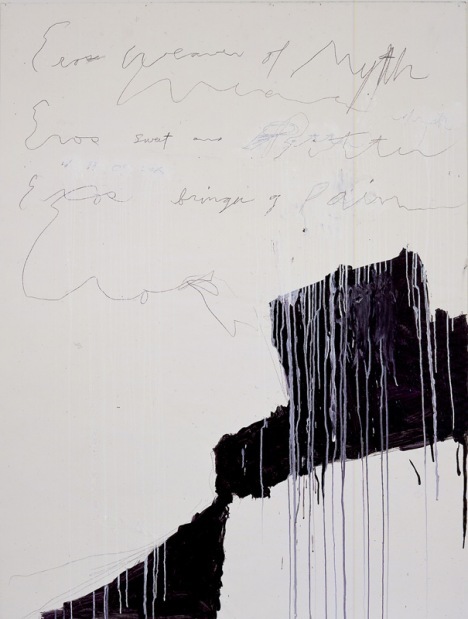 The importance of the modern German poet Rainer Maria Rilke to Twombly includes the figure of the Orphic poet and their shared interest in the ancient River Nile. 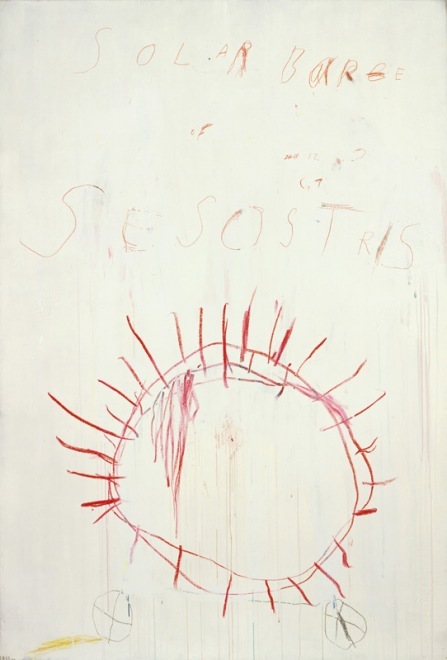 Twombly’s Egyptian series, Coronation of Sesostris, 2000, represents a late flowering of his remarkable graphic inventiveness. that falls on the dark earth in the early Spring. 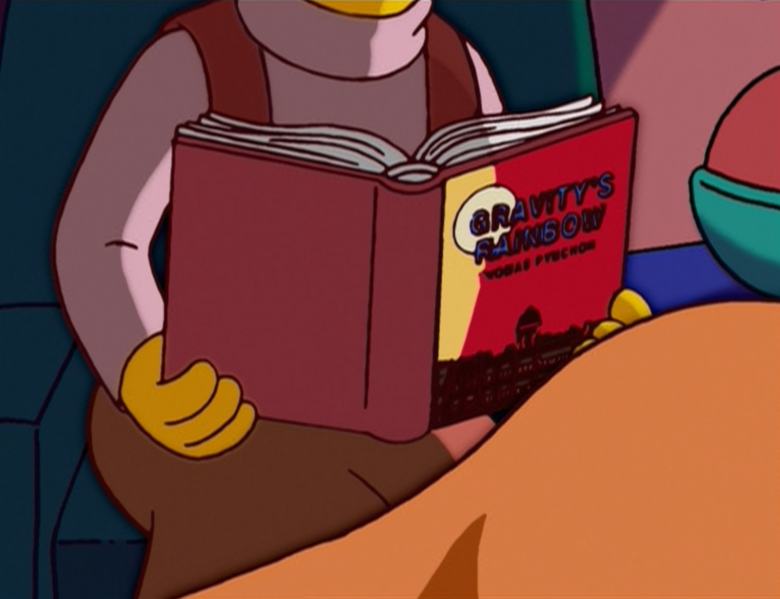 There are many idioms of improbability, used to denote that something is impossible or unlikely to occur. 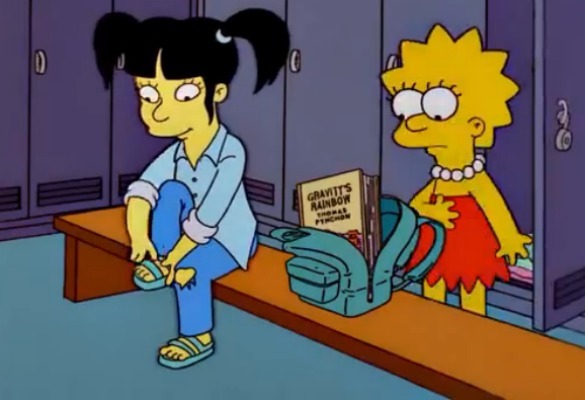 In French the expression “La semaine des quatre jeudis” is traditionally used to mean that the specified even “will happen (or not) during the week of the four Thursdays”, since thursday was the break in the school’s week. it released him away again.